Target has a new line of housewares: Threshold. Some of the stuff is awesome and some is junk. I found it interesting that on one store shelf, there were two items that gave me complete opposite reactions. One item I loved and the other I hated. That reminded me that many people love the thing I hated and many people hate the thing I loved. I delight in how different we are! Footnote: If you check back on Friday, I’ll reveal in the comments which of these two things I loved and which thing I hated. 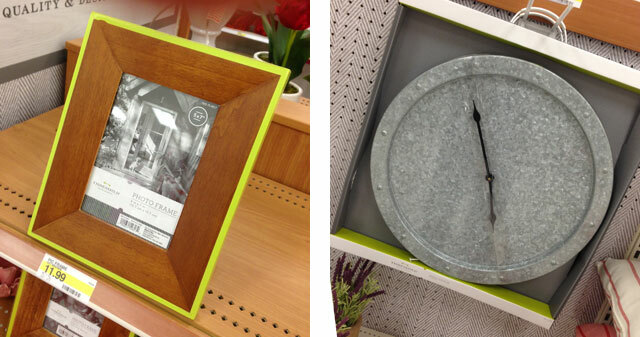 So (drumroll)… I liked the picture frame and hated the clock. Hah! That’s funny! I saw that clock in the store yesterday and thought “Hey! That’s Paul’s clock!” I can’t say I hated it, but it wasn’t really for me. I didn’t go looking for the frame. Can you tell us why you hated the clock? Deb, I’m too much of a form-follows-function guy. The time is not really very easy to read. Also, I thought it might look good in a garden shed, but not my living room. I actually don’t like either of them, but I’m with you on the clock being worse. It looks like a manhole cover, and (as you said) the time is hard to read. I think if I was forced to put up that clock (to prevent hurt feelings or something), I would take a Sharpie to the raised hour dots. I would like the frame better with a different colour border — navy blue, deep red. You could have fun with the clock by setting the correct time, then hanging it so that the dot for 7 or 10 or 2 or anything besides 12 was straight up.